1819 – David Loring purchased the land and pond and had his Lead Pipe Works business there until 1854. 1830 – David Loring construction the home at 169/171 Commonwealth Avenue and lived there for several years before moving to another location. The Silvio family has owned this home. 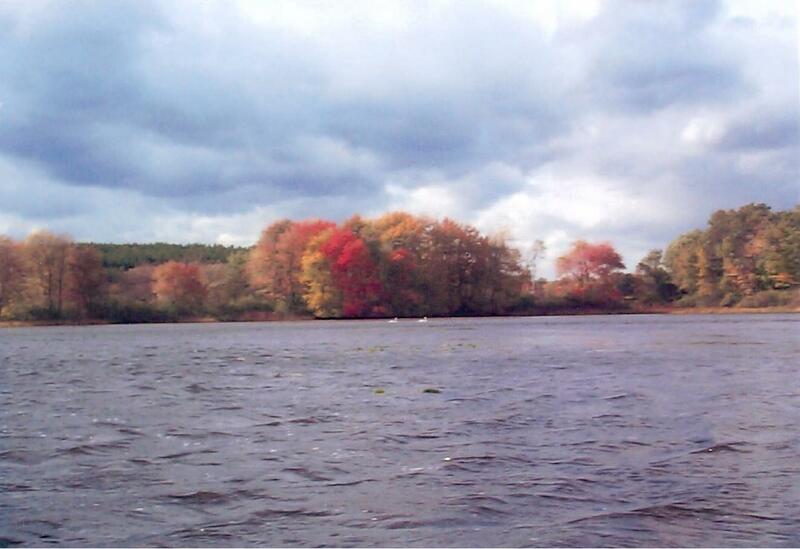 1850’s – Warner’s Pond was and is still considered the most prominent geographical feature near Concord Junction. (West Concord Village). 1854 – The Pail Factory operated on the same site as David Loring’s Lead Pipe Works. This was also the site for the Garnet Mill on the other side of Commonwealth Avenue, presently where Nashoba Bakery resides. By the late 1880, the pond became a center for recreation in all seasons of the year. “The Grove” behind “Commonwealth Row” (near the present boat landing off Commonwealth Avenue) was a picnic spot. The pond was full of small boats and Rev. Walter Campbell from the Union Church had a steam launch named the “Maude Blake” which was rented out for boating parties for many years. Sledding, ice skating and fishing, both in summer and winter were popular sports. Late 19th century ice houses were kept on the northeast corner of the pond to back up ice businesses. These burned sometime around 1895 and were never replaced. Henry Thoreau named the big island on Warner’s “Myrica Island” because of the Sweet Gale he saw growing there. 1896 – West End Land Company purchased most of Ralph Warner’s property, including the pond and the first project on the pond was to build a wooden bridge, no longer there, from the Commonwealth Avenue shore to the large Island, then named “Isle of Pines”. Several camps had been built on this island. 1944 – West End Land Company transferred ownership of the large island (the Isle of Pines) in Warner’s Pond, approximately 6.07 acres in size, to the Girl and Boy Scouts of America. Deed is signed by Burleigh L. Pratt and Harold Orendorff, Trustees. 1961 Town Meeting – Article 44 – Town voted to approve purchase of Warner’s by Town of Concord. 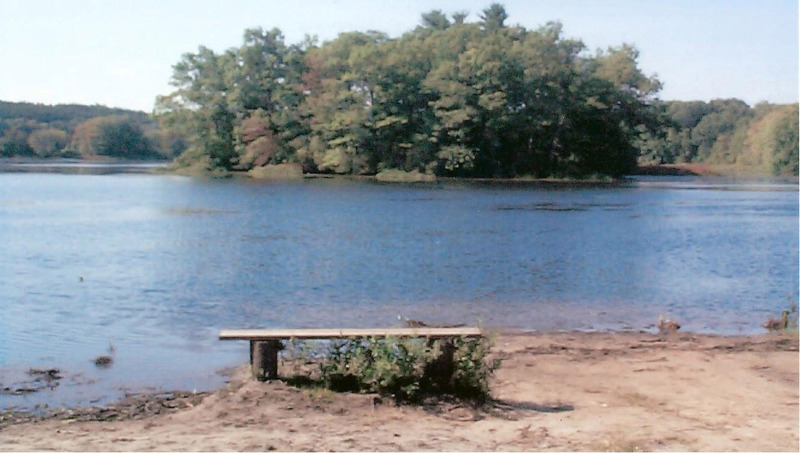 1962, May 8th – Deed of Warner’s Pond signed by Town Counsel, John J. Sheehan. VISUAL ASSESSMENT: Describe topography and layout. Note structures such as bandstands, gazebos, sheds, monuments and fountains: note landscaping features such as formal plantings, body of water. Compare current appearance with original, if possible. 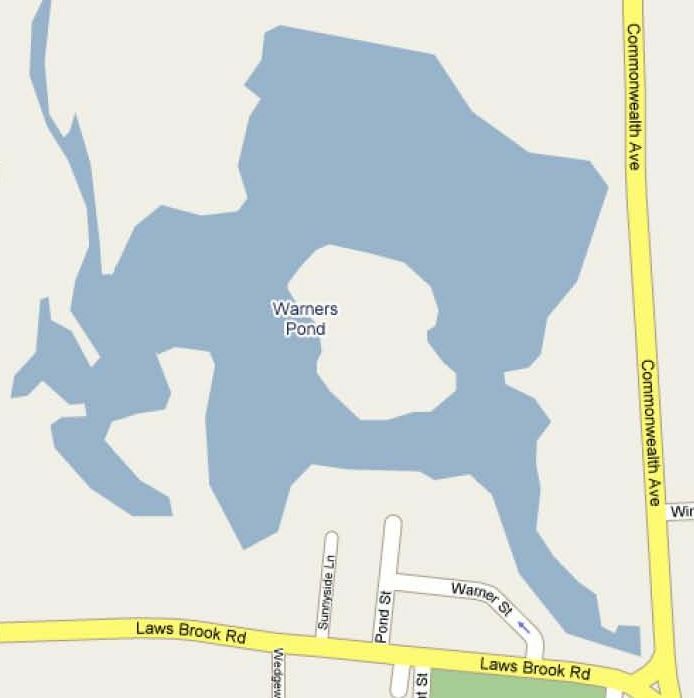 As it was in the late 19th century, Warner’s Pond today is the most prominent geographical feature near Concord Junction. A quiet oasis between busy Rte 2 and the residential/Commercial area to the southeast, there are only a handful of houses on its shores. The pond presently covers 77 acres, an even wider area than the originally formed in the late 1850’s. Roughly circular in shape, the east portion of the pond is occupied by two islands; the large one is the densely-wooded, 6 acre Isle of Pines. The southwest portion is a swampy wetland area. The terrain around the pond varies from flat meadowland, which rises to wooded upland from south to northeast, through cornfield to the north, pine-covered hills to the northwest, and marshes on the west, where Nashoba Brook enters. At the outlet at the southeast end of the pond, tow deteriorated mill dams, and the raceway of an early 19th –century sawmill, (portions may be remnants from a fulling mill dating to the late 17th-century,) channel the water under commonwealth avenue at the Pail Factory Bridge. 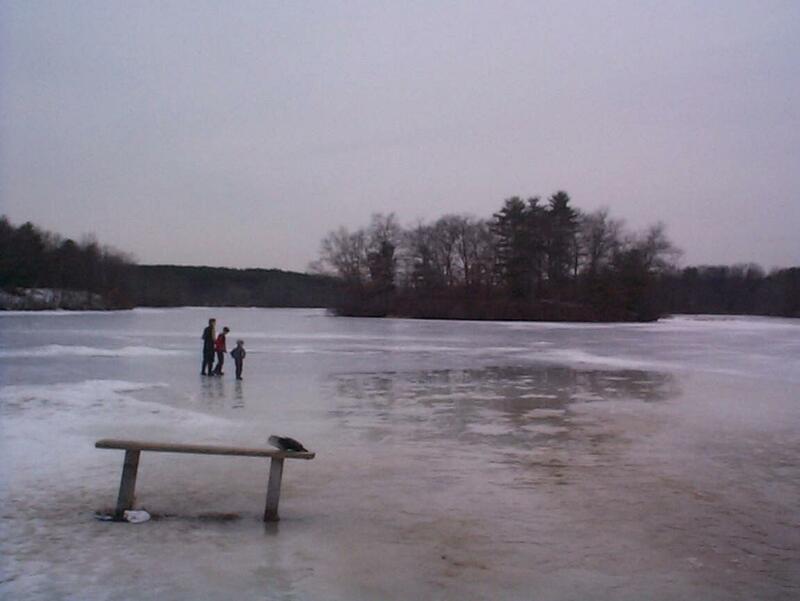 Along with the building he put up on this extensive Concord Junction land holding, Warner’s Pond remains a monument to Ralph Warner, the entrepreneur who created it in the late 1850’s by raising the existing dam. 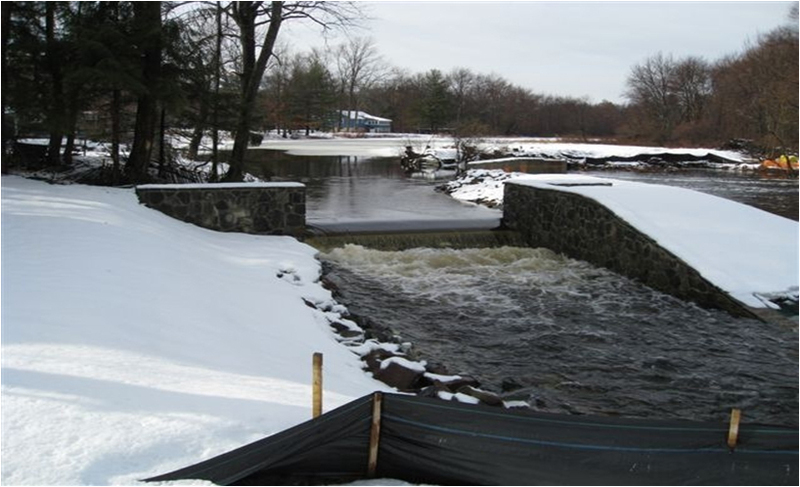 The new dam provided the increased water power needed for the wooden tub and pail factory he operated for over 35 years just across the road from the dam, on the site of David Loring’s 1819 Lead Pipe Works. 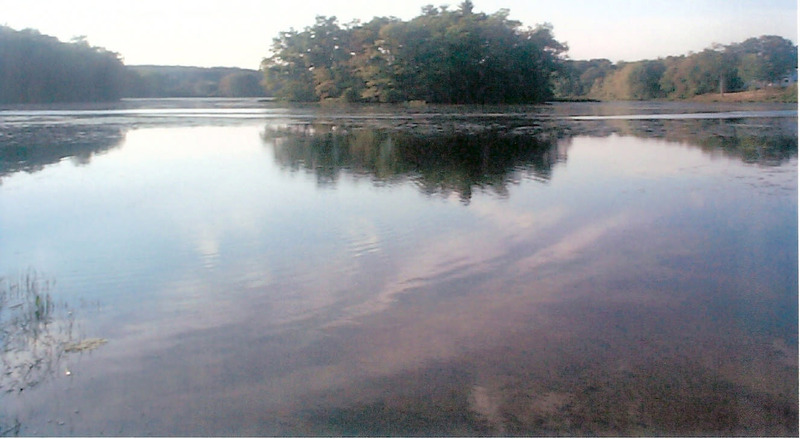 Through the second half of the 19th century, as settlement in the Concord Junction area mushroomed, the pond took on more and more importance in the lives of local residents. Ice businesses operated there throughout the period, with ice houses located at both the northeast and southeast corners. By the 1880’s, the pond had become a center for recreation in all seasons of the year. In the winter, skating and sledding were lit by Japanese lanterns hung in “the Grove” behind “Commonwealth Row”, where a picnic area was located in the summertime. A craze for “naphtha launches” filled the pond with small boats during the 80’s and 90’s and the Union Church’s pastor, Walter Campbell, became well-known in the Concord area for his steam launch, the “Maude Blake”, which for many years was rented out for boating parties. When the Concord West End Land Co. acquired most of Ralph Warner’s property in the late 1890’s, one of their first projects was to build a wooden bridge (now gone) from the Commonwealth Avenue shore to the Isle of Pines, were several “camps” had been built. Today, the pond itself is owned by the Town of Concord, and several acres on the north side are still farmed by the inmates of the Northeast Correctional Center, as they were by inmates of the Mass. Reformatory before them.